Madeleine The Magician is this charismatic multi-talented New York Magician who is always requested because her magic shows are not only impressive, exciting and engaging, but fun. Madeleine’s reputation amongst her peers is wide spread. 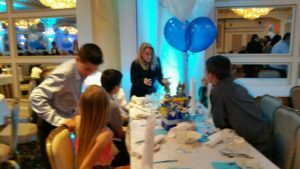 This circle of magicians knows that her shows are always perfection personified and for this reason they always recommend her for any party or event. This female magician involves her audiences as no one else can. Madeleine The Magician puts the “P” in PIZZAZZ. She is truly one of a kind! Madeleine creates her Adult Close Up and Strolling Magic Shows to be impressive, sophisticated and mind-blowing. Her wit, charm and intelligence will make you feel proud that she was the entertainer dressed in her Tuxedo, chosen by you to perform for your guests. During her performance at your Wedding, Corporate Party, Trade Show, Office Party or Event, she promises you will hear, “WHAT? No Way, No Way! WHAT? HOW?…IT CAN’T BE!” YES, a real thrill for your guests and an experience to remember. If for your Bar or Bat Mitzvah you are thinking of something that will warm all of your guests’ hearts, Madeleine will perform her magic for the Candle Lighting Ceremony that will make you “KVELL”! In addition at your celebration, MTM will include her Levitation/Suspension in Mid Air. Madeleine will Levitate…Suspend…Float in Mid Air not herself, but the Bar Mitzvah boy or Bat Mitzvah girl. An astounding moment of disbelief performed right in front of everyone’s eyes! This is a true fan favorite. Finally “The Real Deal” for every kids party: A magician who magically includes the Birthday Child as The Star of his or her party. She includes Dove Magic, her special Levitation/Suspension of the birthday child or another and always includes all of the children with an abundance of Audience Participation. Madeleine The Magician is especially aware of one of her gifts and treasures this remarkable gift, more than most. She has been given the gift… the ability…the joy, to reach kids and adults with special needs like learning and emotional disabilities, especially Autism. The Parkside School said of Madeleine in a letter also on this site, “To capture and hold the attention of our special needs children is truly a talent…obviously one that she possesses”. From The Jewish Education for Children with Special Needs, “Your warmth and sincerity of our “Special Children” made it possible for all of our children to be involved in and entertained by your performance. The children’s big smiles and shining eyes told us how much they enjoyed the show”. Madeleine is extremely well known in this community. She has also performed for Autism Speaks, The HASC Schools, The Public Schools, The School for Language and Communication Development, The Pie Schools and so many others. Madeleine has also performed for organizations that work with adults with autism such as WORC. Madeleine is known as The Harry Potter Magician for two reasons: she is the magician who performs for J.K. Rowling and secondly, her all Harry Potter related Magic Shows, will make you feel as though you are actually sitting in a classroom at Hogwarts. Wingardium Leviosa! Madeleine’s Magical Marriage Proposal blends Romance and Passion back into a fairytale. Madeleine The Magician challenges you to play DAZZICAL, her Interactive Card Trick with her. Choose any card and she will reveal it to you. Sit down, relax, enjoy and play DAZZICAL! 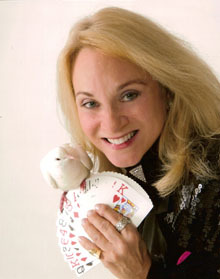 Just a quick note: Lady Magic Enterprises, Inc. will be producing Madeleine The Magician’s expanded show, DAZZICAL. Everyone who MTM has shared this new show with is calling it a Renaissance in Magic!